Starking Delicious × PRI 610-2, sown Lafayette, Indiana 1962; second selection released 1972, PRI (Universities of Purdue, Rutgers and Illinois Co-operative scab resistant breeding program), USA. Patent by Flemings. Scab resistant, good tolerance to fireblight and mildew. 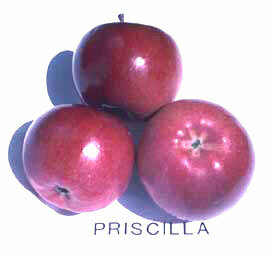 Prima, Cripps Pink, Cripps Red. Medium small, flat, long stalk in a wide shallow basin; partly closed eye in shallow wide-ribbed basin; pointed calyx sticking up. Deep crimson, 90–100%, slight stripe with bloom. Creamy flesh; crisp, juicy, sweet; not much flavour. Mid March, about a week before Delicious.